Cardinal Ratzinger describes the influence of Fr. Teilhard de Chardin on the conciliar constitution Gaudium et spes and on the thinking of the Bishops in the aftermath of Vatican II. For clarity sake, we define the terms of Teilhard de Chardin that may not be familiar to the average reader. Biogenesis - evolutionary process of life. The energies that emanate from this process form the Biosphere, an imaginary cloud over the concrete biological world. Anthropogenesis or Hominization - evolutionary process of men. The energies of thinking that emanate from this process form the Noosphere [sphere of knowledge]. The Noosphere would be a cloud situated above the Biosphere. Christogenesis - Christ would be the start and the end of evolution, its Alpha and Omega. All the energies of the universe would be continuously rising to some superior level that would be a movement toward Christ. 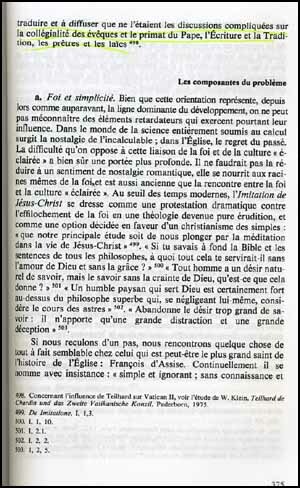 Top right is a picture of the book's cover; at right , photocopies of the French text. Below, we present our translation of the highlighted text . In Catholic milieus, the Second Vatican Council encouraged the accord with that general tendency [optimism toward the world]. Prior to it, the awakening of theology and an entire new understanding of Scriptures, the Fathers, Liturgy, and an openness in relations among divided Christians had raised a new enthusiasm for science. It had even set back the traditonal pragmatism of a great part of theology students. Such theological knowledge appeared to them as a promise of new possibilities for the faith, new roads for the Church. The signal sent by Teilhard went further. In a bold vision, he included the historical movement of Christianity within the cosmic process of evolution from Alpha to Omega. This process was conceived as the Noogenesis, that is to say, the development of consciousness in the evolution of men, to form a Noosphere above the Biosphere. This means that evolution is henceforth understood as a type of technical and scientific development in which Matter and Spirit, the individual and the society constitute a global ensemble, a divine world. The conciliar constitution on the Church and the Modern World [Gaudium et spes] followed the same train of thinking. 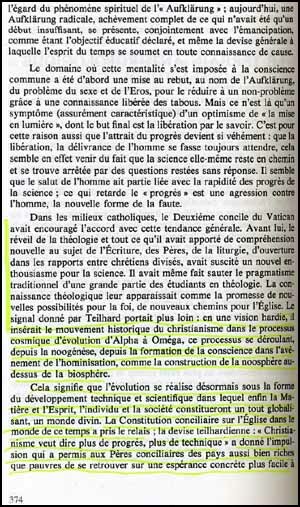 The Telhardian maxim: "Christianity means more progress, more of the technical" was what encouraged the Conciliar fathers from both wealthy and poor countries to feel a more facile and concrete hope to translate and spread this notion rather than the complicated discussions about collegiality of Bishops, primacy of the Pope, Scriptures and Tradition, priests and lay people. 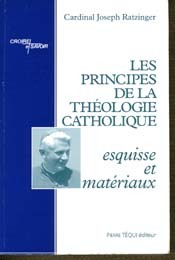 (Les Principes de la Theologie Catholique - Esquisse et Materiaux, Paris: Tequi, 1982, pp. 374-375).